ROUND ROCK, Texas - Round Rock Express outfielder Brian Bogusevic was named as a reserve on the Pacific Coast League All-Star team, the league office announced Thursday. The PCL All-Stars face their International League counterparts in the 23rd-annual Triple-A All-Star Game, hosted by the Lehigh Valley IronPigs at Coca-Cola Park in Allentown, Pa. The game is schedule for Wednesday, July 14, with a 7:07 p.m. CDT first pitch; the game will be broadcast live on the MLB Network. 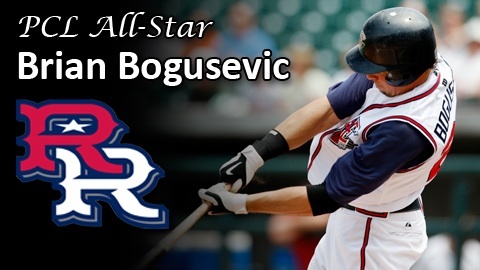 Bogusevic is Round Rock's lone representative on the 30-man squad. The Astros 2005 first-round pick out of Tulane is hitting .289 with eight homers, 36 RBI and six stolen bases. He leads the PCL with 61 runs scored and ranks sixth in the league with 89 hits. Bogusevic leads the Express with 28 multiple-hit games and ranks second on the squad with eight multiple-RBI outings. Daren Brown of the Tacoma Rainiers will skipper the PCL All-Star club, which features some of the top hitters and pitchers in all of Minor League Baseball. Thirteen players were elected to the squad by the balloting of the clubs' field managers and general managers, members of the media and online fan voting, while 17 were selected by the Pacific Coast League office. Each club has at least one representative on the team. Round Rock returns to action Thursday night, opening a three-game series against the Memphis Redbirds. First pitch is scheduled for 7:05 p.m. CDT at AutoZone Park in Memphis, Tenn.